So I am sitting at my friends house watching the game, enjoying myself rooting for the Celtics. Then the ball goes out of bounds and ABC shows the stands for a split second. Out of the corner of my eye...is that....it sure looked like a....YES!!!! 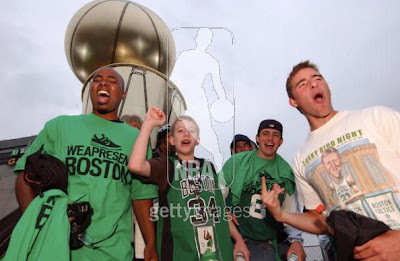 So I ran home to get online to see if I could find out for sure, and thanks to getty images I can bring you a solid picture of the Weapresent Boston t-shirt. It features the Converse Weapon in the classic Boston Celtics colorway. I sure hope one these shows up on eBay because I need one in my life. I can only assume that there will be a Weapresent LA t-shirt too.